It’s all part of being a responsible pool owner, ensuring a balanced pH level and maintaining it to remain so. pH is the level of acidity of the water, ranging from number 0 to 14, the right acidity should always roughly 7.2 to 7.8. A pH level above 7 is indicating that the water is actually alkaline while below that level is considered acidic. A highly alkaline water will result in scales forming on the pool surface and equipment. An acidic water, on the other hand, will corrode the surface of the pool and equipment, potentially damaging them. You want the pH level to be neither too high not too low. Maintain the right pH balance level and you will spare yourself the cost of damage to the pool and equipment due to imbalanced pH level. How to lower pH in pool? You are going to need to do a few tests and know what chemical to use. Understand that generally your main water source, from public water lines etc., is usually at a higher level of pH, slightly too alkaline even. Hardware and water lines will corrode at a much faster rate if the water is acidic. With more water you add to the pool, the pH level will be raised along. You will only be dealing with alkaline water, so you would only need to lower the pH to a manageable level for this case. With that, you might have pushed up the pH level as you add more water. Next time, only add as much as you need to minimize the pH spiking away. To know how much for the pH level to reduce, we are first going to need to test the pool current pH level. We will then decide the chemical to use to lower the pH level. The two main chemicals you can generally get your hand on for pool pH maintenance is muriatic acid and sodium bisulfate (or dry acid). Both can be bought, labelled with names along the lines of “pH decreaser” or “Minus”. Be sure to know which of the two you are going to get the application method is different. Just stick to one. How to Lower pH in Pool? Sodium bisulfate is a common chemical for decreasing pH. To use this product, you need to read and closely follow the instructions that come with the product. Different manufacturers will provide different percentages of the chemical. 93.2% is the common percentage. Assuming you have calculated the pH level, you would then need to know how much you are adding based on the instructions from the product. Generally, you should start with three-quarters of the recommended amount and slowly add more until the water is at a comfortable level. You can always add too little, but you never want to add too much. The chemical usually comes as a powder. Avoid trying to apply it on windy days, unless you live in a really breezy area. If that’s the case, add it with the wind blowing away from you. You are dealing with acid here and can be hazardous if it starts sticking all over your clothes or even worse, your skin. While adding the powder, get as close to the water surface as possible to avoid the blowing anywhere that isn’t the pool. Find your water return jet sights. That’s where you want to pour the powder in since that’s how the water gets into your poor. Avoid adding the powder from the inlet sights (skimmer area etc.). It’s crucial that the chemical spreads all throughout the pool and reaches every corner evenly. The powder should dissolve by itself in roughly five to fifteen minutes. You don’t need to spread it with your bare hands awkwardly stirring the water. After the wait, it’s time to retest the pH level once again. There is no need to delay for more than a day since the last addition to testing it. For above ground pools, add the chemical from over the wall. Ground pools are usually shallow and so might cause it to not dissolve properly. You might need to spread the powder over the pool surface for even distribution. Once again, read the manufacturer's note before you start using muriatic acid. You are dealing with hazardous acid that can easily burn the skin and damage surfaces of the pool if misused. Make sure you are dressed right for the job. Calculate the amount of the acid that you need to add to the pool with the pH level you initially tested. Add in three-quarters the amount recommended by the manufacturer. Test the pH level again and keep adding little by little to the desired pH level. You can only decrease the pH level, but not increase it. The acid comes in liquid form. Some instructions might recommend diluting the acid in a bucket of water first. If so, then follow their instructions. While the chemical comes as a liquid, it doesn’t mean that the wind couldn’t still easily ruin your day. Face downwind when you apply the chemical. Don’t pour the liquid into the skimmer or filter basket. Note: strong acid, highly corrosive, will damage most of the things it touches. Two ways to add the chemical into your pool. It’s up to your liking on what you choose since both are effective anyway. Go for the one you think you are more comfortable with. 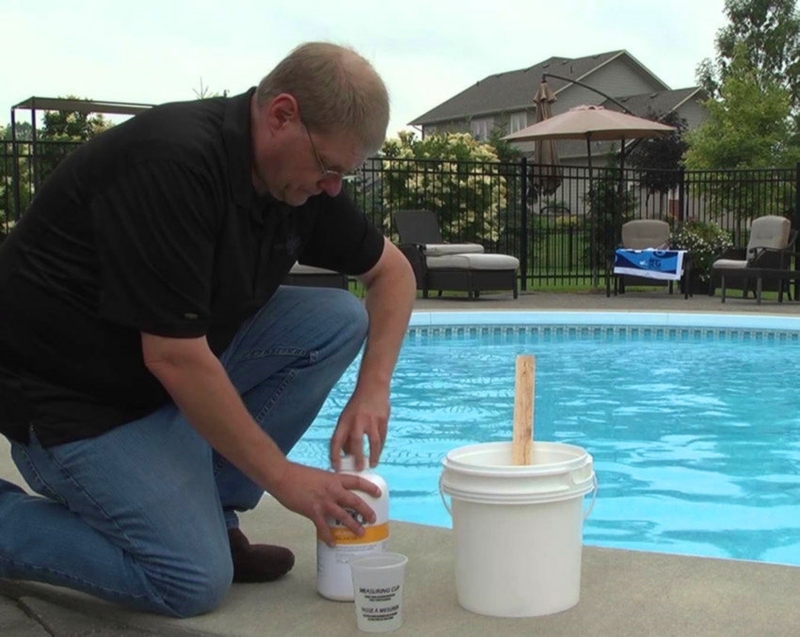 The first method is to simply pour the chemical in a single spot right into your pool. Turn off the pump if you do this method so the chemical could reach the bottom rather than just affecting the top half. Turn the pump on afterwards to allow the chemical to dissolve well. Alternatively, you can pour the liquid close to the water return jet. This way, the acid will spread across the pool evenly. If your pool doesn’t have a deeper end, then pour it evenly all around your pool to avoid the acid concentrating in one area. Server responsed at: 04/25/2019 12:17 p.m.